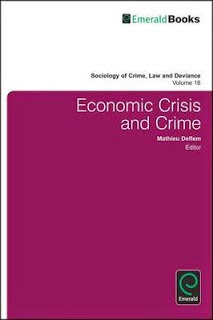 This is the Introduction to Economic Crisis and Crime, edited by Mathieu Deflem. Bingley, UK: Emerald, 2011. Please cite as: Deflem, Mathieu. 2011. "Introduction: Criminological Perspectives of the Crisis." Pp. ix-xii in Economic Crisis and Crime, edited by Mathieu Deflem. Bingley, UK: Emerald. Writing shortly after the economic turmoil that set in since the Fall of 2008, it is clear to any reader what is meant when reference is made to ’the’ crisis. The financial crisis that developed out of the implosion of the United States housing bubble that reached its peek around 2006-2007 no doubt can be told, in its origins and consequences, in terms of a complex economic tale. But even and especially for non-experts, the crisis need not to be argued to be of special significance in any more detail than to consider the reality that, on a near world-wide scale, millions of people have lost their jobs and/or their homes, while governments have been scrambling to develop appropriate policies to rectify conditions which they had helped to create. Naturally, the crisis is primarily a matter of economics, finance, and other such issues which, from a technical-practical viewpoint, are outside the purview of sociology and criminology. Yet, what can be valid as well as useful about social-science perspectives devoted to the study of crime and crime control, as the contributions in this volume will testify, is to focus on those dimensions, dynamics, and implications of economic crisis that belong most intimately to the scholarship of criminology, in general, and criminological sociology, in particular. Social scientists have historically devoted much attention to a wide range of societal implications related to crises in the economic realm. Karl Marx (1867) virtually equated the study of the forces of capitalist production with the study of crisis, as he saw economic crises and their political and other social implications as a phenomenon inherent to the development of capitalism. More restrained and arguably more sociological in orientation were the relevant perspectives developed by Emile Durkheim and Max Weber. In his essay Die Börse (The Stock Exchange), Max Weber (1894) argued, on the basis of his theory of rationalization, that financial actors legitimize their work with reference to their specific expertise and that, therefore, any moral considerations may be less appropriate to consider than are financial-technical concerns. From a different approach, Durkheim (1893, 1897) offered a sociological perspective of the organization of labor in society that devoted special attention to the distinctly social or moral implications of crisis moments in the economic realm by examining the consequences for crime, suicide, and other behavioral patterns. The intellectual foundations of criminology and criminological sociology have likewise on occasion focused on the impact of crisis on crime and its control, typically as part of a more general focus on economic development and organization. The seminal works of Bonger (1916), Sellin (1937), and Rusche and Kirchheimer (1939) come to mind. In the further unfolding of modern sociology and criminology, economic crisis has from time to time remained an issue of concern, especially among critical criminologists who aligned, in more or less explicit fashion, with Marxist theorizing (Godefroy & Laffarguelien 1984; Greenberg, 1993; Greenberg & Humphries, 1982). Yet, it is also true, perhaps logically so, that the theme of economic crisis strikes scholarly thinking mostly then when a crisis occurs. By its very nature, a crisis is somehow delineated in time and space, even and especially when it is intense and highly consequential. The very nature of a crisis, then, perhaps explains why it has served as an inspiration for scholarly reflection only on certain moments, though this cannot be an excuse for scholarly indolence. In any case, the present day is a time for serious reflection on economic crisis, and the authors in this book show that social scientists with an attention for crime and crime control are up to the task. Briefly reviewing the chapters in this volume, a first set of contributions deal with the mortgage crisis, arguably the most central component of the crisis from an economic viewpoint. Tomson Nguyen and Henry Pontell analyze how deregulatory fiscal policies created conditions that brought about a tension with legislation to foster racial and economic equality. Deregulation contributed to increase fraud by lenders, which disproportionately impacted minority populations. Laura Patterson and Cynthia Koller also address the fact that lenders were willing to take on more risks. They show how business practices associated with housing led to the creation of a criminogenic environment with homebuyers as its primary victims. Nicole Piquero, Marc Gertz, and Jake Bratton address the mortgage foreclosure crisis by analyzing the public perceptions of the crisis as one among other influences on crime control policy. The authors find that a majority of the public blames the banks and the lenders for the crisis and additionally that about half of the examined respondents favor regulation of relevant economic enterprise. Within the context of predatory lending, Harold Barnett, finally, discusses the case of a subprime loan made out to a straw borrower which victimized an African-American couple in Chicago. Barnett details this interesting and puzzling case of equity stripping fraud, including the role played by investment bank Goldman Sachs. The chapters in Part II address various aspects of the criminologically long-standing topics of corporate and white-collar crime in the context of the crisis. Michael Levi examines the societal reactions to white-collar crime under conditions of the financial crisis. He argues that the crisis affected government reactions to fraud, yet also that the seriousness of business-elite crimes has been downplayed, unlike other crimes. Wim Huisman offers food for thought to unravel the causal mechanisms of corporate crimes and the economic crisis. Identifying four possible scenarios, Huisman astutely differentiates between the causes of criminal behavior and the processes of the criminalization of such behavior. Focusing on one specific form of white-collar crime, David Shichor, Henry Pontell, and Gilbert Geis analyze three cases of illegally backdated stock options. The authors dutifully recommend multi-disciplinary attention to the issues by combining both economic and criminological expertise. The final part of this book includes chapters that examine various consequences of economic crisis for criminal developments and law enforcement. Paul Harris offers a theoretical discussion of the criminal consequences of various changes that have been brought about in neighborhood structure as a result of home foreclosure. Reviewing strain, social disorganization, and disorder theories of criminology, the author introduces the notion of suburban insulation as an appropriate conceptual avenue to the problem at hand. Richard Peterson examines the relationship between (un)employment and intimate partner violence on the basis of data from the National Crime Victim Surveys. Contradicting suggestions made in the news media, he shows that unemployment is only weakly related to rates of intimate partner violence. Finally, Darrell Irwin investigates how local police departments across the United States have been affected by the economic recession, specifically by having faced budgets cut. This development, of course, has affected the quality of police work that can be offered, which in turn may have consequences with respect to criminal developments. As a whole, the chapters in this book hope to offer a useful set of analyses of criminological issues concerned with important aspects of economic crisis that will appeal to students and scholars in criminology, sociology, economics, criminal justice, and other relevant social sciences. The unprecedented scale of the economic recession that has begun since the late 2000s on a global level will necessitate criminologists from various disciplinary background to take these issues seriously for quite some time to come. Bonger, W.A. (1916). Criminality and economic conditions. Boston: Little, Brown, and Company. Durkheim, E. (1897) 1951. Suicide: A study in sociology. New York: The Free Press. Godefroy, T., & Laffarguelien, B. (1984) Crise économique et criminalité. Criminologie de la misère ou misère de la criminologie? Déviance et société, 8, 73-100. Greenberg, D.F. (ed.) (1993). Crime and capitalism: Readings in Marxist criminology. Philadelphia: Temple University Press. Greenberg, D.F., & Humphries, D. (1982). Economic crisis and the justice model: A skeptical view. Crime & Delinquency, 28, 601-609. Marx, K. (1867) 1978. Capital, Volume One. In R.C. Tucker (Ed. ), The Marx-Engels Reader (pp. 294—438). New York: W.W. Norton. Rusche, G., & Kirchheimer, O. (1939). Punishment and social structure. New York: Columbia University Press. Sellin, T. (1937) 1972. Research memorandum on crime in the depression. New York: Arno Press. See the complete Table of Contents of this book.